Mount Semeru Trekking Tour Package 3 Days 2 Nights | Mount Semeru Summit is a tour package that we offer to you who have a hobby of climbing to the top of the mountain namelly is mount semeru. This tour will visit volcano of Mount Semeru East java, Mount Semeru known as the highest volcano mountain in Indonesia especially in Java. Peak of Mahameru with a height of 3.676 Meters Above Sea Level ( MASL ). Mount Semeru Trekking Tour Package have duration is 3 Days 2 Nights, Before start enjoy Semeru Tour, the visitors very suggested to prepare the body health because they will spend trekking for 4 hours duration from Ranu Pane (parking lot) to Ranu Kumbolo by camping then continued to Kalimati (the second rest area) and start Semeru Summit Hiking at midnight. then from Surabaya/Malang then you will taken to Ranu Pani villages with air conditioning vehicle take 5 hours from Surabaya and 2 hours from Malang. On the second day after having breakfast you will start hikking to Ranu Kumbolo lake by 4 hours trek. Ranu kumbolo is the beautiful lake and very natural place for break. Hopefully all the member will arrive in Kali Mati in afternoon, having dinner and stay overnight there I suggest you must to go to bed at 19.00 for getting power to hike the mountain. 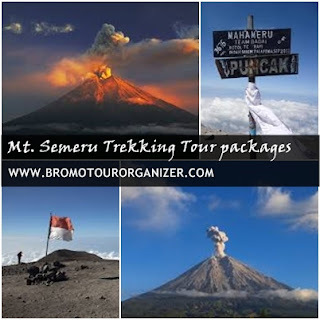 For Detail Information about Mount Semeru Trekking Tour Package Or Mount Semeru Summit and other Bromo Tour Packages, You can call us via our contact. © 2015 Bromo Tour Organizer. All Rights Reserved. Support By Paket Wisata Bromo.